Zhang Jigao, deputy chief designer of the J-10 fighter, spoke about the improved model J-10 publicly for the first time in the AVIC flight test center. Zhang Jigao told People's Daily Online reporters that the overall performance of the J10 will be comprehensively improved in areas such as aerodynamic layout, mission system, and the approach to maintenance. 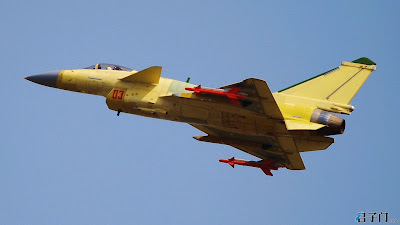 In March 2009, pictures of our improved model J10 fighters appeared for the first time on the Internet, and netizens quickly began to call it the "J-10B". Over the last five 5 years, several images of the test J10B have appeared online,attracting widespread attention from netizens, military enthusiasts, and even foreign media. U.S. military expert Richard Fisher recently pointed out that the J-10 B is a so-called"fourth and a half" generation fighter equipped with modern airborne technology and advanced radar system, which is about to be delivered to the PLA Air Force. Zhang Jigao disputed the term "fourth and a half" generation. In contrast, he suggested that the current international criteria to classify generations are more applicable. fighter depend on many factors. "This does not mean that the optimization of an aircraft's radar, avionics, and missile detection ranges are bound to improvements in operational performance."